Finally! A South themed gift for all! This funny doormat features a hilarious southern quote sure to get your guests laughing! Perfect outside door mat for the college and professional football lover in your life! This funny football gift measures 18 x 27. Affordable and unique gift idea for campers! This funny door mat features the text "Home is where the welcome mat is." Buy this camper welcome mat today! Make visitors to your home giggle with this funny doormat! Features the caption "Free Range Oraganic Children - Raised with Love" Made in the USA. Ship a gift and surprise a friend with this funny doormat. Made from 100% olefin with perfect bound stitched edges and printed with color-fast inks. These doormats are 18" x 27" and are made from 100% Olefin. Makes a great and affordable gift. See what kinds of funny reactions you get with this humorous doormat which reads, "Welcome: Just Don't Expect Much." This funny garage doormat features the text "Do not touch my tools or my daughter". Perfect as a gift you can use this indoor or outdoor. 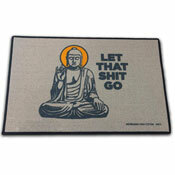 Our funny doormats are made in the US and comes in the size 18 x 27 inch. Second best selling mat! Great to give for gifts. These doormats are 18" x 27" and are made from 100% Olefin with perfect bound stitched edges and printed with color-fast inks. Hilarious sarcastic door mat will have all of your guests laughing. Featuring the text, Hello My Name Is: Keep Walking, this funny welcome mat would be a great gift for the silly person in your life. This humorous doormat would make a perfect gift for the funny people in your life! Greet the visitors to your home with a chuckle. Our best selling mat! High quality mat will have your visitors laughing when they wipe off their shoes. Order today! Third best selling mat! This mat makes an easy gift which everyone can appreciate. Simple joke on the mat will have you giggling each time you step inside your home. Order online for an affordable gift, even with shipping added. These doormats are 18" x 27". Printed with color-fast inks. This hilarious welcome mat features the phrase "Let That Sh*t Go" The perfect item for any holiday or birthday gift to family and friends. "There's No Place Like Home" Welcome Mat by High Cotton is a great way to protect your flooring investments, while providing your guests with a welcoming message. MUST HAVE welcome mat for parents with teens! This hilarious sarcastic welcome mat features the text: Caution! Teenager On Premises. Hilarious sarcastic welcome mat perfect for your front doorstep. Welcome mat reads "Oh Crap, Not You Again!" These 18" x 27" doormats are made from 100% olefin yarn with perfect bound stitched edges and printed with color-fast inks. Hilarious welcome mat is perfect for any family home! This mat can be used inside or outside and is made in the USA!